There isn't a pitch you can name that this pitching machine can't throw. Fastballs, changeups, sliders, curves, screwballs, knuckleballs - left or right handed and at up to 105 miles per hour. Let's see a major league pitcher do that! 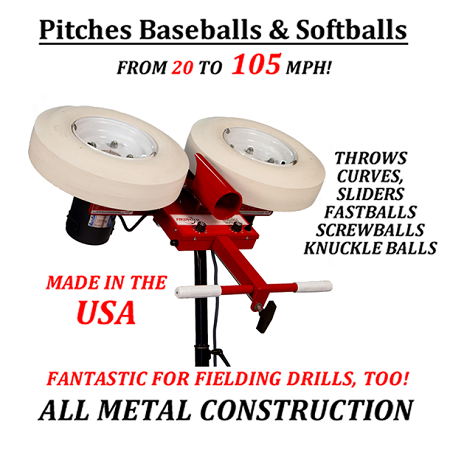 At least $500 less than similar JUGS and Atec machines, the First Pitch Curveball Pitching Machine is definitely one of the best buys for the money you are going to find! The First Pitch Curveball is available as a baseball machine, a softball machine or as a combo baseball and softball pitching machine (the combo machine is $100 more). The softball-only machine throws 12" softballs but the combo baseball/softball pitching machine can throw 11" or 12" softballs in addition to baseballs. 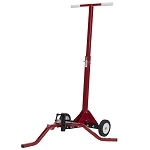 Assembled by hand entirely in the USA, the First Pitch Curveball Two Wheel Pitching Machine features steel and aluminum construction that makes it both durable and lighter than other pitching machines. Its high powered American made horsepower Leeson Motor and Minarik DC drive is fully housed in 3/16" thick steel and can throw dimple or regulation baseballs or softballs from 20 to 105 miles per hour. The First Pitch Curveball pitching machine also features easy, no-tool height/angle adjustment controls and two dials with markings to easily select the wheel speed of each tire. A dual handle allows the wheels to be easily tilted to quickly adjust pitch type. Two full size pitching machine tires makes it not only super accurate, but the air-filled tires are more durable and kinder on balls than the hard wheels on some other pitching machines. The First Pitch Curveball's adjustable legs make it easy to quickly switch from baseball to softball without any tools and each leg is capped so that the pitching machine can be used on any surface. Not only is the First Pitch Curveball pitching machine great for pitching baseballs or softballs, it's fantastic for fielding drills, too. A convenient knob adjustments allows the machine to rotate 360 degrees so that you can cover the entire field for fielding practice, tossing towering pop-ups and fly balls. And, because it is a two wheel machine, it can throw much more realistic ground balls than a one wheel machine can (one wheel machines put backspin on every grounder). All adjustment knobs on the First Pitch Curveball Baseball and Softball Pitching Machine are nickel-plated aluminum, the main bracket is black zinc-coated steel and all other parts are red, powder-coated aluminum. Like all First Pitch machines, the Curveball Two Wheel Pitching Machine features a full 5 year manufacturer's warranty and 14-day satisfaction guarantee. It is powered by any standard 110 volt electrical outlet. PLEASE NOTE: Although the First Pitch Curveball pitching machine can throw regulation baseballs or softballs, dimple balls pitch far more accurately and last practically forever. The pressure exerted from pitching machine tires is known to soften regulation balls and may eventually damage the covers of real balls - especially softballs, which have very thin covers. Real balls also create more wear and tear on pitching machine tires. Throws left handed and right handed fastballs, curves, sliders, screwballs and knucklers - up to 105 MPH! Quickly adjust pitch height and speed - no tools needed! Great for fielding - throws grounders and towering fly balls and pop-ups! Pro - Good and functional machine; consistent and adjustable. Everything I have ever expected from a machine of this type. Con - Heavy machine; definitely requires an adult for movement, but I hope this converts to solid, durable results. Rough design on the adjustment release handle, but easy to fix with a little modification. Pro. Very solidly built machine that met all my expectations. Throws consistent pitches with little adjustment. Will throw some super fly balls as well as a variety of pitches. Con. The manufacturer really should supply a little better documentation. Heavier than I anticipated due to the second motor and wheel but that really can't be avoided. Q: Does this machine throw baseball balls? And all kind of piching? A: All real baseball pitching machines on this website CAN throw regulation baseballs. That doesn't mean you SHOULD ever use real balls. Pitching machines are not as accurate with real balls, the balls wear the wheels out faster and, because of the pressure exerted on balls by the wheels, real balls are destroyed very quickly by pitching machine wheels. The only machines that will not harm real baseballs are the Zooka machines and the Iron Mike machines, but they are not as accurate as pitching machines that use wheels. The First Pitch Curveball pitching machine can throw almost any pitch a real baseball pitcher can throw, including fastballs, changeups, risers, sinkers, knuckleballs and everything from a full side curve to 3/4 curves and anything in between. A First Pitch Curveball two wheel pitching machine can throw any dimpled pitching machine baseballs, lite balls or regulation baseballs. If you are going to use regulation balls, please only use the highest quality leather balls and realize that they will not be as accurate as dimpled balls. Also know that the seams on real balls will wear your pitching machine wheels out faster and that pitching machines are known to rip the covers off of real balls - especially softballs, which have very thin covers. To ensure your satisfaction, the First Pitch Curveball pitching machine includes a 14 Day Money Back Satisfaction Guarantee. Returned items must be in good, resellable, "like new" condition with original packaging. Unless returning an item that is defective, customers are responsible for the return shipping costs to First Pitch as well as the original actual shipping costs, whether they obtained "free" shipping or not. There is also a 10% restocking fee on all returned items. 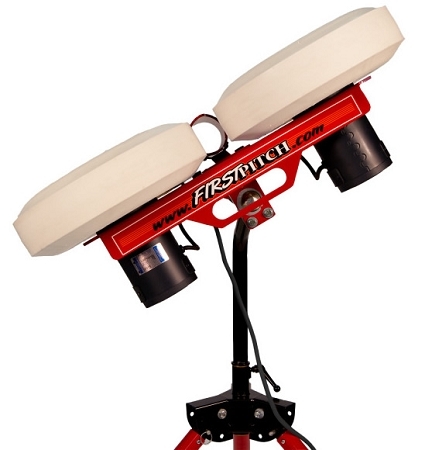 First Pitch warrants the operability of your Curveball two wheel baseball/softball pitching machine for 5 full years for residential use or for 1 full year for commercial use from the date of purchase. This warranty covers all mechanical and electrical parts against premature wear or failure, electrical malfunction, or accidental damage during reasonable normal use. No matter where you order a First Pitch Curveball Pitching Machine from, NOBODY actually stocks them; they all ship directly from the manufacturer's warehouse located in Maple Plain, Minnesota. Therefore, the shipping time frame is exactly the same no matter what website you order from (we hope that it is this one!). First Pitch Curveball Pitching Machines typically take 4-6 business days to ship from the time you place your order. They ship via Federal Express (FedEx) Ground and could take anywhere from a day or two to a week to get to you AFTER being shipped, depending on your proximity to their warehouse. We will notify you of your tracking number the moment we receive it from the manufacturer's warehouse. Click here to download an easy to read, printable PDF of the First Pitch Curveball Pitching Machine Operating Instructions. Click here to download an easy to read, printable PDF of the First Pitch Curveball Pitching Machine Assembly Instructions.